The Fuzzy Pet Foundation/Issues/Cruel Practices/Declawing Cats: Manicure or Mutilation? Cats’ claws and the bones and cartilage that hold them in place allow cats to balance properly, climb, and defend themselves, among other functions. Declawing, which removes these claws, bones, and cartilage, is a painful and permanently crippling procedure that should never be performed. There are effective and humane alternatives to declawing that can prevent cats from inflicting damage with their claws. Why Do Cats Claw Objects? Cats claw to have fun and exercise, to maintain the condition of their nails, and to mark their territory – visually and with scent. They stretch by digging their claws in and pulling against their own claw-hold. 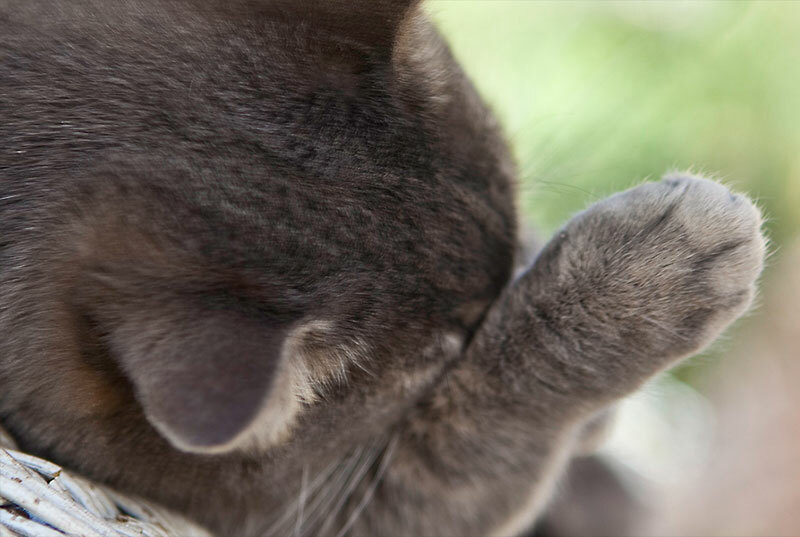 Cats’ natural instinct to scratch serves both their physical and psychological needs. Before domestication, cats satisfied these needs by clawing tree trunks. Today, domesticated cats can be guided to satisfy their desire to claw without damaging valuable property. After surgery, the nails may grow back inside the paw, causing pain but remaining invisible to observers. Declawing results in a gradual weakening of leg, shoulder, and back muscles, and because of impaired balance caused by the procedure, declawed cats have to relearn to walk, much as a person would after losing his or her toes. Trim your cat’s nails regularly. When the cat is relaxed and unafraid, gently press on the toes until the claws extend. Use a pair of nail clippers and cut only the tip of the nail, taking care not to damage the vein or “quick.” The nail hook is what tears upholstery, so removing it virtually eliminates damage. Buy or build two or more scratching posts. They must be sturdy, tall enough to allow the cat to stretch (3 feet or taller), and properly placed. Bark-covered logs, posts covered with sisal, or posts covered with tightly woven burlap work well. Soft, fluffy, carpeted scratching posts don’t work – they are one of the greatest causes of declawing because cats don’t like the posts, and frustrated human companions resort to surgery. If you use carpet, secure it to the posts with the rough backing on the outside; soft carpeting will not satisfy a cat’s need to claw. Place one scratching post where your cat is already clawing and another near the area where he or she normally sleeps (cats like to stretch and scratch when they first wake up). An excellent scratching post is available from Felix Katnip Tree Company, 3623 Fremont Ave. N., Seattle, WA 98103; 206-547-0042. Consider cardboard or sisal “scratching boxes” that lie flat on the floor. These are inexpensive and small enough to scatter around the house, allowing your cat easy access to an “approved” scratching spot at all times. They do wear out fairly quickly, however, and will need to be replaced every few months – otherwise, cats may get frustrated and revert to using furniture. Teach your cat where to claw and where not to claw. Place your cat on the new scratching post and move his or her paws, or pretend to scratch it yourself. This will scent the posts and encourage exploratory clawing. Make the post a “fun” place to be. Play games with your cat on and around the post, and attach hanging strings, balls, and/or bouncy wire toys to it. Try sprinkling catnip on the post, too. (A once-a-week or so refresher application will keep your cat interested.) When kitty uses the post, reinforce this behavior with praise, but be careful not to startle or frighten him or her. When your cat claws furniture, discourage this behavior with a firm voice or other loud noise, but never with physical force. Directing lukewarm water from a squirt gun at the animal’s back is often successful. During the training period, you may need to cover upholstery with plastic or other protection (cats don’t like the slippery feel and will quickly learn to stay away). 1) “Onychectomy (Declawing of Cats),” The Animal Medical Center, 2003. 2) Maria-Elena Choherty, D.V.M., “Feline Declawing (a.k.a. Onychectomy),” AskVetAdvice.com Newsletter, 16 Jun. 2003. 4) S.C. Yeon et al., “Attitudes of Owners Regarding Tendonectomy and Onychectomy in Cats,” The Journal of the American Veterinary Medical Association,” 218 (2001): 43-7. 5) G.J. Patronek et al., “Risk Factors for Relinquishment of Cats to an Animal Shelter,” Journal of the American Veterinary Medical Association, 209 (1996): 582-588. 6) Christianne Schelling, D.V.M., Declawing.com, last accessed 4 Aug. 2004. 7) Geoff Pingree and Lisa Abend, “Abandoned Pets Find Haven,” The Christian Science Monitor, 23 Jun. 2004. 8) Louinn Lota, “West Hollywood Becomes First in State to Ban Declawing,” Associated Press, 8 Apr. 2003. 9) Simone Sebastian, “Supervisors Condemn Removal of Cat Claws,” The San Francisco Chronicle, 24 Sep. 2003. 10) Jennifer Conrad, D.V.M., letter, Journal of the American Veterinary Medical Association, 223 (2003): 40-1. 11) Bob Keefe, “California City Considers Ban on Declawing Cats,” Palm Beach Post, 2 Feb. 2003. 12) The Cat Practice, “If You Love Your Cat …” Feline Health, last accessed 4 Aug. 2004.